This is Galanthus milennium, a snowdrop I saw yesterday morning at Cambo Estate in Fife, about 2 hours’ drive from where I live outside Edinburgh. There was still frost on the grass and the ground was hard when we arrived just after 10 AM, but there were no clouds and these snowdrops were catching the light from the pure blue sky as we passed the side of the house. The kids were delighted to discover a trampoline ready for bouncing, just near the house. Dad was supervising, more or less, which meant I was free to explore the back of the house, its lawn, sheltered seating area and a gorgeous nook by the corner of the house: its tiny table gave a good view down the lawn, through the witch hazels, and I could hear the plash the fountain out front of the building from where I sat. ” Where’s Mummy?” I could hear the kids say – “Hiding,” I thought to myself, and it wasn’t long before they discovered my seating place. But miraculously, thanks to Dad, I was able to explore the rest of the place including the stunning walled garden, in more or less solitude for the next hour or so. 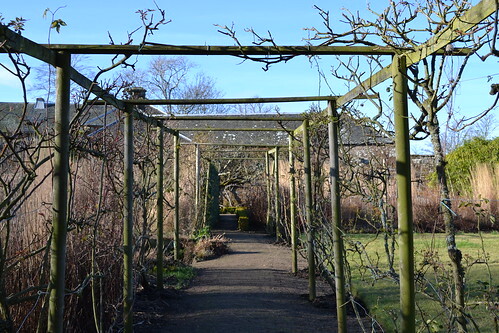 My fixation is roses, as you may know, so well-pruned pergolas in the depths of winter hold tremendous interest for me. They’re pruned beautifully at Cambo Estate. The sleeping garden also convinced me I need to do more with grasses, most probably stipa tenuissima. 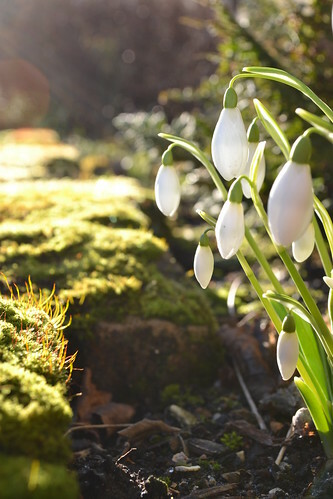 We didn’t come at peak snowdrop time – that’s in about 2 to 3 weeks, but it was still a delightful visit, and I decided to get a membership so I could come back to the tulip festival and ideally the roses from July. Attempting to buy a membership to the garden was the only hiccup. I had noticed that a single membership is usually 15 pounds, and a sign in the coffee shop said it was available now for 5 pounds off. When I inquired about this in the plant shop, I was greeted with a blank stare from the humourless attendant, who then marched me in silence back to the coffee shop to verify what I had said. Never mind. My memories of the garden will not be wrapped up in that, but in the pleasure of the space, the plants and the rather good cake. I’m looking for recommendations for New York Gardens to visit in April – can you help? Stonecrop – long way out of NY, but well worth it. Good write-up in Hortus. High Line, of course. Brooklyn Botanics. Storm King (sculpture park) – again a long way out of New York but great display of sculpture in a natural setting. Thank you Robina, I am going up to Margaret Roche’s garden so Stonecrop is quite possible. Thank you so much for the ideas!